Sam Darnold hasn’t looked overmatched in his first NFL training camp. The Jets' rookie quarterback has shown poise, mobility and confidence during hot August practices when each time he takes a snap or drops back his every move is scrutinized and judged. Now, Darnold will really be under the microscope. The Jets kick off the preseason Friday night at MetLife Stadium against the Falcons, which also could be called the unofficial start of the Darnold Era. Darnold acknowledged that he’ll probably be a little emotional. How he performs now that the action will be real and he’s facing pressure in these four exhibition games will determine whether he will start the regular-season opener in Detroit Sept. 10 or be on the sideline with a clipboard. 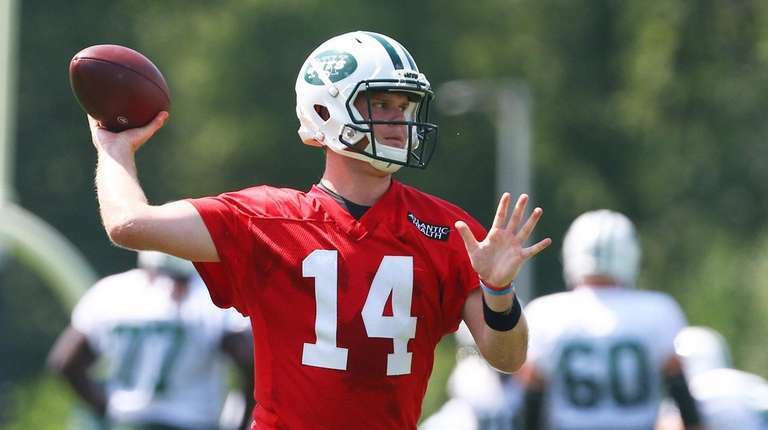 Darnold was a holdout for the first three practices of training camp while his agents and the Jets worked out his contract. Now, the hope remains that the Jets found their franchise quarterback with the third pick in the draft. Darnold has made his share of mistakes, as he’s overthrown or underthrown receivers in camp. He was picked off three times in the last two practices. But he also has made some really good throws and was effective in the red zone. He moved well in the pocket, evading rushers and rolling to his right to complete passes. “We’re very excited about Sam and we’re very excited about his future,” Jets general manager Mike Maccagnan said. Maccagnan pulled off the big trade with the Colts, moving from the sixth pick in the draft to the third to better position the Jets to nab a quarterback they hope can lead them for the next 10-plus years. After the Browns surprised many by selecting Baker Mayfield with the first overall pick, and the Giants took running back Saquon Barkley at No. 2, the Jets selected Darnold, who threw 57 touchdowns and was intercepted 22 times in two years at USC. The Jets are going to give Darnold the opportunity to earn the starting job. Coach Todd Bowles has been consistent in saying the QB depth chart is Josh McCown, Teddy Bridgewater and then Darnold. Bowles also said he would let the preseason determine the Week 1 starter. “I realize I have to be smart in all my decisions and sound with everything,” Darnold said. Darnold has been receiving the bulk of the reps in practice — more than McCown and Bridgewater combined over the past three days. McCown could start against the Falcons and play just one series, followed by Bridgewater and then Darnold. McCown played only three series last preseason and earned the starting job. Bowles is comfortable with McCown and knows what he can do. It’s possible Darnold will see the most game action during the preseason as the Jets try to fast-track the rookie who has worked hard to get caught up after his late arrival to camp. The Jets also have been impressed with Bridgewater, signed during the offseason after Kirk Cousins signed with Minnesota. Bridgewater, the former Vikings quarterback, has looked sharp as he continues his return from a devastating knee injury that essentially cost him the last two years. Bridgewater also could be a valuable trade asset, especially if Darnold shows he can be the future of the franchise. Bridgewater isn’t concerned about his future. He’s happy to be healthy and playing again. If you are attending Jets games, mobile tickets are the only method for entry. Print-at-home tickets are no longer available. To access your tickets, download the Jets Official Mobile App, tap “Tickets” and then “Access My Tickets.” For more info, visit newyorkjets.com/faqs/mobile-tickets-faq.